Not much music approaches us from above. But with the increase use of drones for all kinds of applications, the birds seem to have lost their unique position for aerial music. In his performance, Drohnenmusik (2013-2014), Genoël von Lilienstern developed a loudspeaker drone. By attaching four small loudspeakers to this unmanned aerial vehicle, he created a flying sound producer. 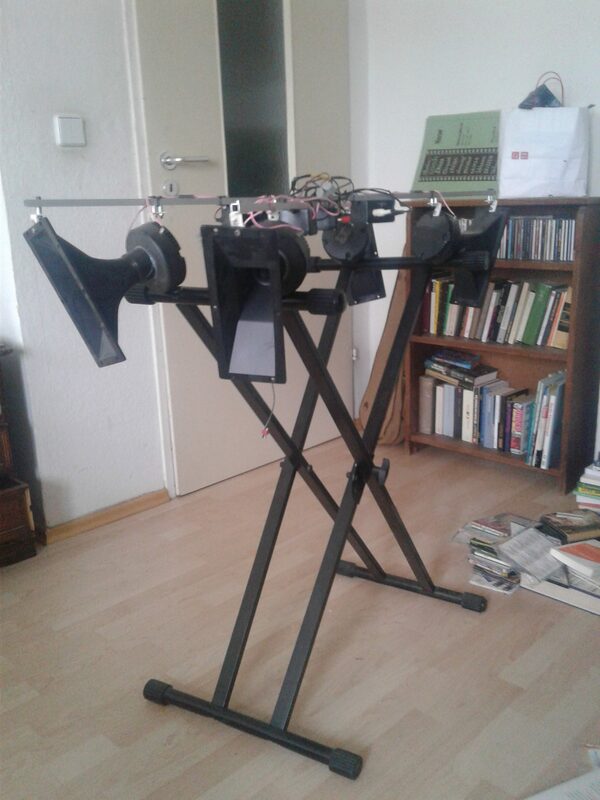 Genoël constructed an aluminium frame with four small loudspeakers, four 12-Volt Kemo-amplifiers, and an mp3 player. 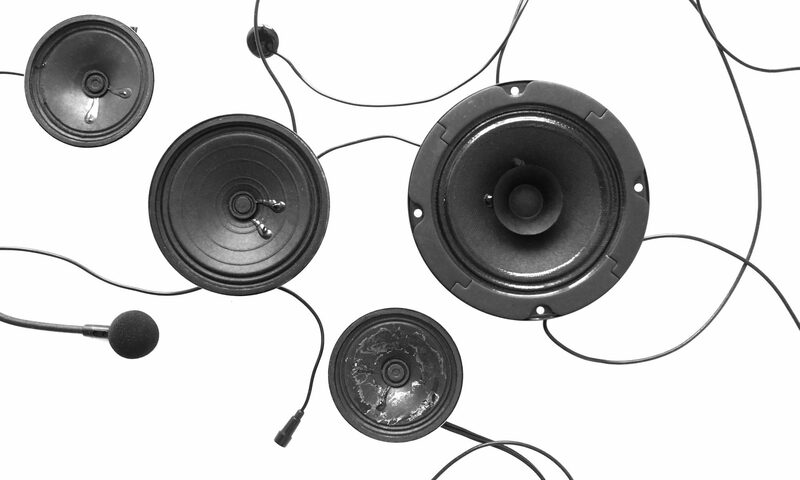 The two-channel audio signal of the mp3 player is diffused through these four small loudspeakers. The whole construction weighs around 2.5 kg. This meant that the drone had to be able to carry this weight, which was not easy to achieve a few years ago. Another problem is that the magnetic field of the loudspeakers can interfere with the electric motors of the drone, which might cause a crash. To avoid this, there is around 40 cm distance between the loudspeaker construction and the drone itself, as you can see in the picture. 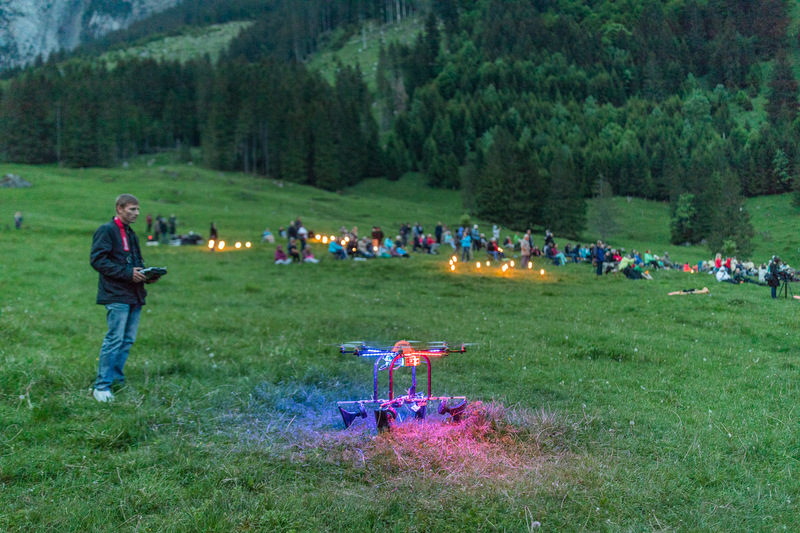 During the performance, a choreography is followed: first, the drone is as close as possible to the audience and remains static. Then it starts to move more and more, and sometimes flies further away. Bigger figures are performed before it comes back and the piece ends after 6,5 minutes with the drone slowly going down again. 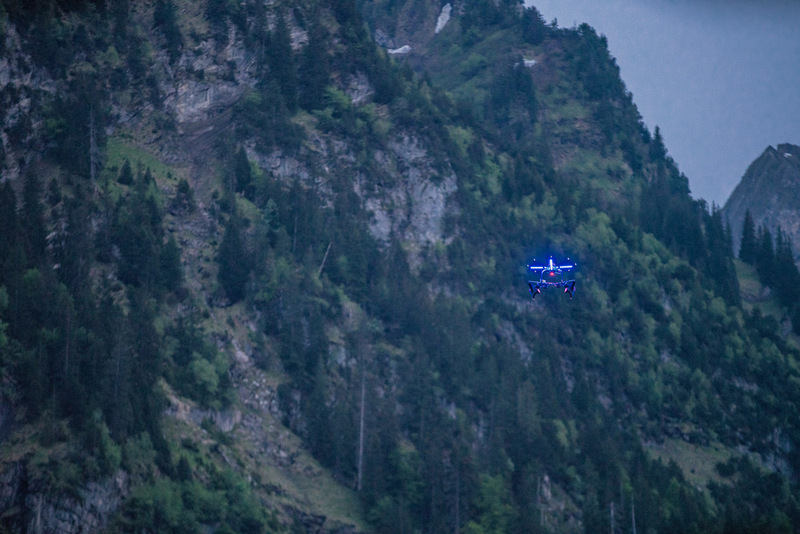 A few problems occurred during performances: in Switzerland it is officially forbidden for a drone to get closer than 100 meter to an audience (and as you can see in the picture below, the drone came closer). Performing in Berlin close to the Kanzleramt caused the organisers to worry if the drone would accidentally activate some air defence mechanisms. Working on this project a few years ago, consumer-oriented drone technology was far less advanced, less popular, and more expensive than it is nowadays. Genoël got in touch with a professional drone builder, who was experienced in building drones for HD cameras and with whom he developed this loudspeaker drone. As Genoël told me, building a new loudspeaker drone would probably be easier nowadays, not only due to the innovations in drone technology, but also due to innovations in loudspeaker technology, resulting in lighter speakers, often also producing more bass frequencies than the ones he used. What I enjoy especially is the huge contrast between the coloured lights and electronic noises created by the drone and the environment—a romantic garden or mountain landscape—that the drone is exploring. They are sonically and visually of a completely different character. The loudspeaker drone seems to be a retro-futuristic object, left behind by an unknown music culture. Thank you for answering my questions, Genoël!